LIGHTWEIGHT AIRPRENE BODY - The lightweight airprene body is pre-shaped to conform to the natural bend of the elbowallowing the pad to provide ultimate comfort and flexibility. DYE MICRO INJECTION LOGOS - Micro injection logos complete the design in typical DYE fashion. NEW CUP-SHAPED EVA FOAM ELBOW PAD - The new cup-shaped elbow pad wraps around your elbow for a more custom fit. This goes beyond the pre-shaped fit of the airprene section. The new cup-shaped design was developed to provide you with the most comfortable fit possible. NEW HOLOWED EVA FOREARM PADDING - This new style of foam wraps all the way around, covering the inner arm and providingmore protection. The hollowed chambers of this new foam allow more air circulation around the forearm by keeping areas of the pad away from the skin, giving the pad a lighter feel. 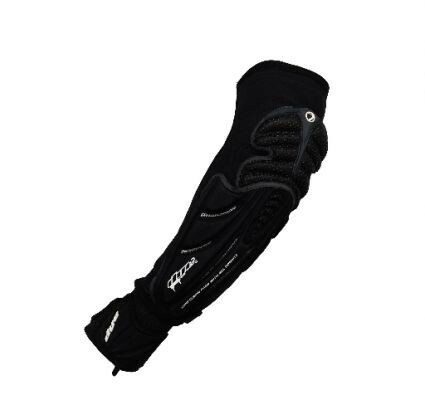 NEW VENT PORTS - The new vent ports and 4-way stretch air-mesh offer optimal air flow to your forearms inconjunction with the hollowed EVA foam for the maximum amount of air circulation of any elbow pad available. GEL INSERTS - The gel inserts are highly impact resistant and help absorb brute force created from intense slides and dives. NEW ADJUSTABLE STRAP - The adjustable strap allows you to tighten the elbow pad to your liking and helps keep the pad in place. NEW INTEGRATED SLIDER GLOVE - The new integrated Slider Glove acts as a glove without the extra hindrance of covering your fingers. This new comfortable design provides reinforced palm protection to help against abrasive slides, while the back of the Slider Glove features neoprene compression for added protection to the back of the hand. The placement of the Slider Glove helps to prevent the elbow pad from sliding up your arm and offers unrestricted movement allowing you to have maximum control and feel of your marker. ELASTIC FINGER LOOP - The elastic finger loop is an optional way to secure the Slider Glove, keeping the pad in place, but without interfering with finger movement. Question about "Dye Elbow Pads"